Title: BNSF C44-9W #4794 leads a westbound at Jarales Rd. Title: BNSF C44-9W#4704 leads an eastbound at Lomas Blvd. Title: BNSF ES-44DC #7728 leads a westbound at Impala Rd. Title: BNSF SD-40-2 #6708 leads the southbound Belen turn at Desert Rd. Title: BNSF B40-8 #542 leads a southbound (to Belen) at Rio Bravo Blvd. Title: BNSF C44-9W #4605 leads an eastbound across Lomas Blvd. Title: BNSF C44-9W #5371 leads a northbound at Gabaldon Rd. Title: BNSF C44-9W #5395 brings in an eastbound at Impala Rd. Title: BNSF GP-30 #2415 is switching at Woodward Rd. Title: BNSF GP-30 #2414 is framed by the control signals for Belen Jct, at Ross Ave. Title: BNSF SD-40-2 #6737 leads the southbound Belen turn at Prosperity Rd. Title: BNSF B40-8 #8602 leads the northbound Albuquerque turn at Woodward Rd. Title: BNSF C44-9W #5395 Leads aneastbound stack train across Impala Rd. Title: BNSF C44-9W #5112 sits at Valentine Rd. Title: BNSF SD-40-2 #6737 leads the Belen turn near Prosperity Rd. 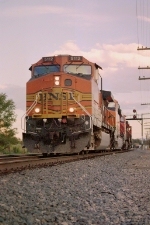 Title: BNSF C44-9W #5209 leads an eastbound at Mesa Rd. Title: KCS 2040 leads a westbound at Impala Rd. Title: KCS AC-4400CW #2040 leads a westbound at Impala Rd.